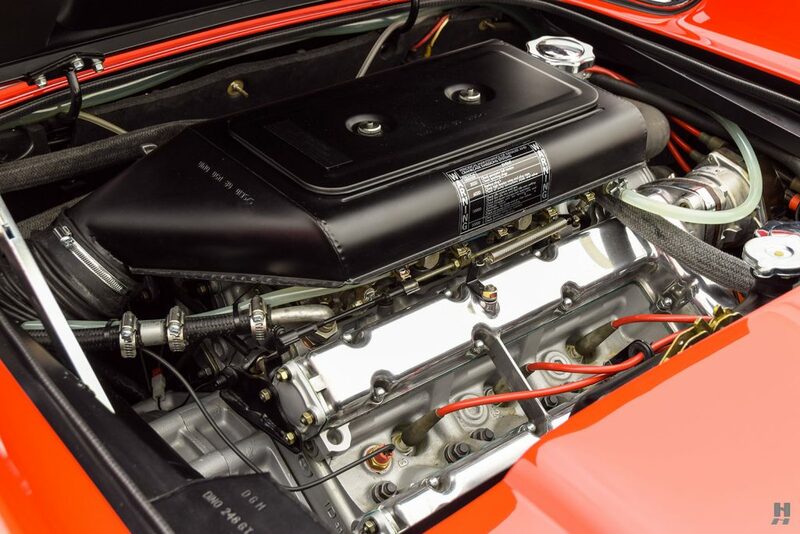 Desirable, matching numbers European-market 246 GT with a fresh, bare metal restoration by Fran Roxas. Factory correct Rosso Chiaro over black. 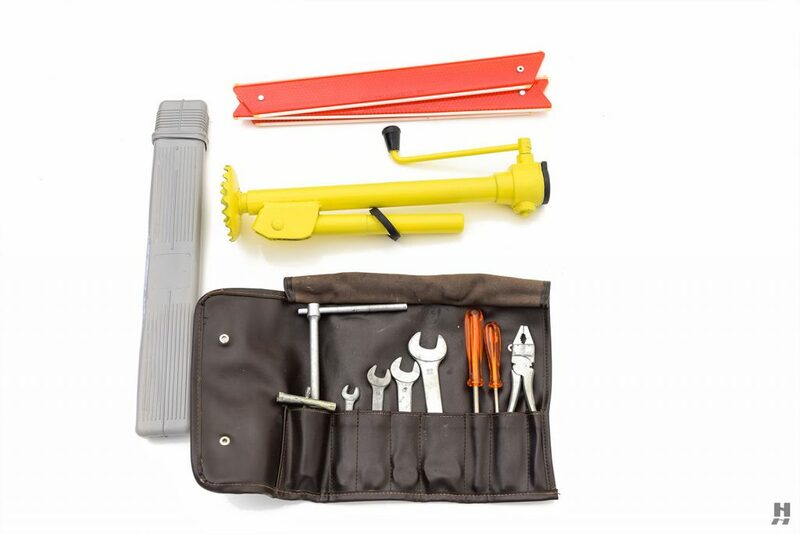 Original tools, books, manuals, and jack, Massini Report. One of the finest Dinos we have encountered and stunning in every respect. 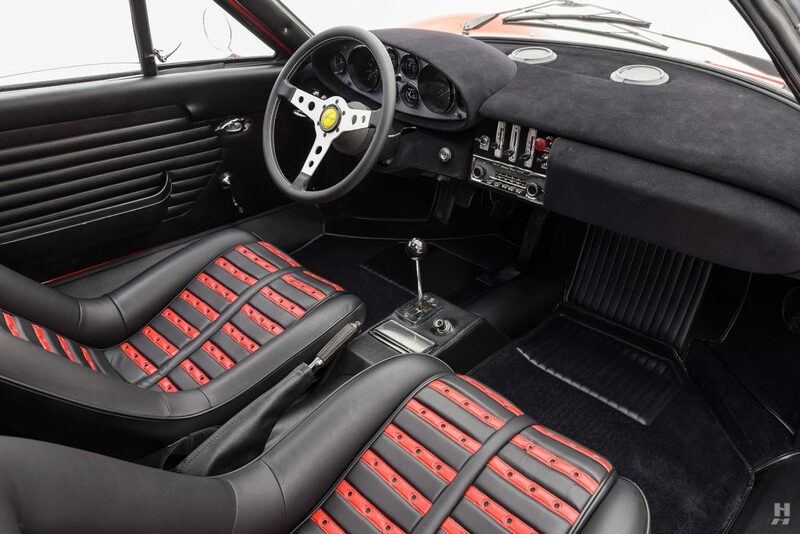 It is with distinct pleasure that we offer this stunning 246 GT, serial number 05036, fresh from a world class restoration by Fran Roxas, and presented in its original colors of Rosso Chiaro over a black interior. S/N 05036 is a desirable E-series, European specification Dino, completed in September 1972 and delivered new to Germany. 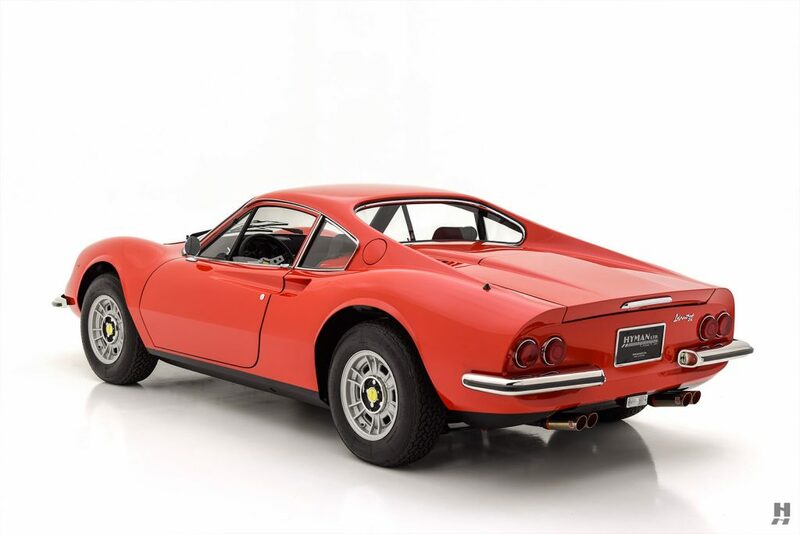 The Dino Registry indicates it left Germany in approximately 1976, headed to California for then-owner, John DiGiorgio. In 1978, Mr. DiGiorgio sold S/N 05036 to Frank Anthony Vizcarra of Richmond, California, who cherished his Dino for the next 34 years. By 2012, 05036 was in need of a freshening, and Mr. Vizcarra sold it to a dealer in Florida, who in turn sold it to the most recent owner. Upon taking delivery, the new owner initially planned to reinstall the engine (which had been removed by Mr. Vizcarra for repairs) and simply enjoy the car as-is following some mechanical sorting. However, the project quickly evolved, and soon 05036 was stripped to bare metal shell in preparation for a methodical, nut and bolt, concours-quality restoration. Photos of the restoration process reveal the car has an exceptionally straight and rust free body and structure. The exquisite paintwork, in factory-correct Rosso Chiaro, is exemplary of the sort of work Mr. Roxas built his reputation on. The color is applied to laser-straight panels with crisp lines and precise, consistent gaps all around. Chrome and brightwork exhibit the same exceptional quality and precise fitment. The car wears all new body rubbers, and the car retains the correct European side markers and new Carello headlamps. Proper 14-inch Cromodora alloy wheels fitted with Michelin XWX radials achieve the factory-correct stance on the road.